Cut the broccoli into pieces and cook for 5 minutes in boiling water. Then immerse the broccoli in cold water and drain them. In a bowl, add the broccoli pieces, egg whites, diced ham, chopped garlic, chilli powder and mix it all together. Slice and de-seed the peppers to obtain 2 rings of pepper each 3cm thick. 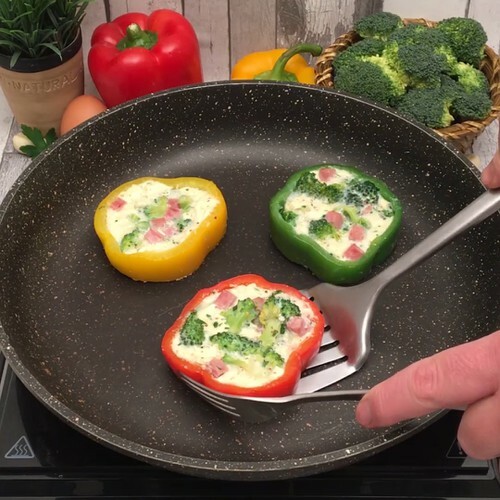 In a frying pan, place the pepper rings and then pour the broccoli and egg mix inside the pepper. Cook for 3 minutes on each side and enjoy.